Brand new U.S.A.F. 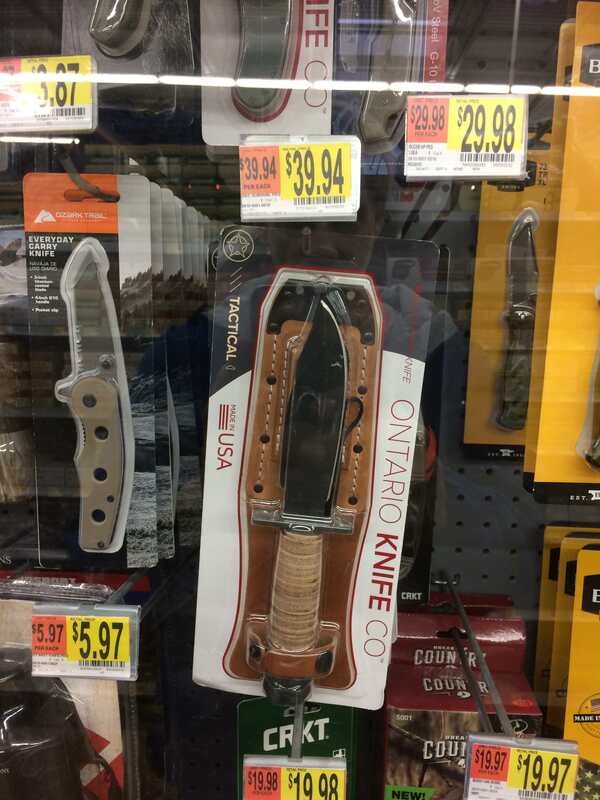 Pilot survival knife at walmart? This blew me away. I doubt it is as good as my original issue but the price is good. Re: Brand new U.S.A.F. Pilot survival knife at walmart? I saw these in my local walmart as well. I was tempted, but managed to resist (barely). I did not see. Hmmm. I recall seeing them at surplus outlets in Sioux City and in ads in magazines back in the late '50s and early '60s. I think the going price at that time was $4.95, but I never pulled the trigger and I doubt that I will now. They're puported to be tougher than woodpecker lips, though! my OLD one keeps an edge better than anything else I own. If you don't mind answering- what is second best. stamped cammiuls something like that. i gave it to a gut called Kratshooter. it was a real one not a knock off. It's an Ontario 1986. I think it used to have 099 or 299 on the sticker on the back of the sheath. It's worn away now though. Not sure what is second best really. All the others I've had to sharpen, I haven't sharpened the Ontario since I changed the angle on the cutting edge. The cheap winchester I picked up at TSC is really holding an edge well. I haven't taken it out back and beaten it yet but been using it for household chores for a long time. still shaves. Love my Mora's!!!!! mine is from 1982, I do not have the Walmart one but I do know the are made by Ontairo . should be good. The fuller has been left off to save cost. Fuller? it looks exactly the same as mine. It's hard to tell from the glare on the packaging in the photo in the OP, but it looks like the fuller is there. Or have you seen one in person? Makes sense as a cost cutting option. I got an Ontario version in a trade a few years ago. I sort of question how effective the fuller is at reducing weight. I can't believe it would add very much flex reduction in such a short thick blade. My guess is that the government has been paying top dollar plus for these Pilot Survival knives since they have been issuing them, I doubt that those being offered for $40.00 are up to the same standards as the gov. issue knives were, sheaths are probably thinner and made of a cheaper grade of leather, and the knives out of less expensive steel. But Ontario Cutlery has always had a decent reputation for making rugged and serviceable knives, at forty bucks the buyer is probably getting more than their monies worth. I've never owned one, but I have friends that love them and I seen quite a few that have been modified to better suit their owners such as cutting down the guard and thinning out the blade and putting a convex edge on them, they are still pretty tough and most likely make a good hard use blade for batoning and digging with to harvest wild edibles. Looks like a good deal to me . Batoning, according to some of the reviews, is not one of its forte's.....the blades tend to break in two when even moderate batoning is attempted. They probably still work OK for making sandwiches, though. I do not have one of the walmart specials , however in another forum a VP of Engineering at ontairo stated they were made for walmart with out the fuller or shapened false edge. That's disappointing to hear. I guess there are ways to cut corners even though the equipment and methods to do a decent job of HT should be well established in a company like that. I was reading the reviews at Amazon and several broken blades came to light in the reviews from the 'One Star' boys that were knife-battening aficionados. Remember it is a stick tang and some people just don't know how to baton correctly. The 2-3 knives that broke didn't break anywhere near or in the tang. They snapped at about the 1/2 way point in the blade. I don't know what they were trying to baton, as for the type of wood, but I recall one of them broke when attempting to split a 3" diameter stick into kindling. It MUST be true because I read it on the internet, so if some of you guys buy these things, it would be interesting to get the REAL story on how they hold up in that regard. Before or after you snap the blade ? Seriously, that's sad to hear, the only knife I ever had from Ontario Knife Co. was a RAT-5, it was a real beast, but I have a hard time warming up to tactical looking knives and sent it on down the road, I did use it on a few outings and it held up very well, but it wasn't a Made for Walmart Special and did sell for over $100.00 at the time. After getting into this bushwacking thing I bought, sold, and tried a lot of inexpensive knives before it dawned on me that I had spent a lot of money on budget priced blades and had very little to show for it, I'd been better off spending the money on a high quality knife to begin with. I did just that and have never regretted it.